This is my all time favorite summer produce casserole (not that I am particularly well versed in summer produce recipes). It is amazing to think that I used to hate tomatoes…. As a kid, I would be so mad when my mom made BLTs (I would get over it when I realized I was allowed to eat toast and bacon for supper). Luckily, I’ve since been convinced of the deliciousness of these glorious garden gems! Sprinkle 1/2 cup of dry rice into a greased two-quart casserole dish. Pour 1/4 cup of water over casserole, unless your tomatoes are SUPER juicy. You need to ensure there is enough liquid to cook the rice. Cover in foil and bake at 375* for one hour. I have to get credit to my friend Sarah for this recipe. She shared it with me the first year I gardened and walked away with exorbitant numbers of tomatoes and zucchinis. Don’t even get me started on how depressed I am that tonight’s dish was made with store-bought zucchinis since my plant died this year! 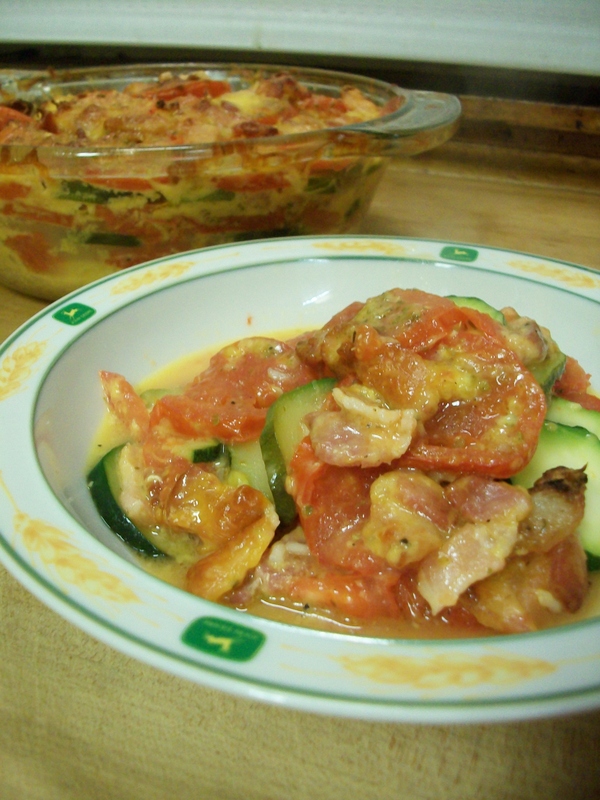 Posted in CasseroleTagged bacon, casserole, cheddar cheese, Cook, healthy, produce, rice, tomato, zucchiniBookmark the permalink.